It would be technically correct to say that the Washington wine industry's roots were set down in Woodinville all those years ago when Chateau Ste Michelle established their Woodinville location as a kind of wine destination. It has become the state's ground zero for consumer wine education with over half of the state's population within an hour drive. Washington wine drinkers, largely are being exposed to Washington's bounty via Woodinville and their demand for Washington wines has driven an industry. And the industry has boomed from 19 wineries in 1981 to over 800 today. The wine industry has grown, and Yakima Valley, Horse Heaven Hills, Walla Walla, Red Mountain and the Columbia River Gorge among many other AVAs have come to shape the state and it's wines. Woodinville however remains at the forefront. Today there's a new crop of Washington winemakers; making their wine in the warehouses of Woodinville and it's some of the most exciting stuff going on in the state. (This man's opinion anyways.) I liken what's going on with these new producers in Woodinville to the vibe in Walla Walla a couple-three years ago when Kerloo Cellars, Rotie Cellars and Reynvaan were really making folks sit up and take notice. Over the last many years there has been a trend in Woodinville wine production, in my opinion, that has led to an almost "house style" of Woodinville wine. That formula has been a sort of emulation of the style of wine-making that has been successful at Delille Cellars. Extracted wines, ripe, with big tannin and plenty of new oak. We do however appear to be seeing a shift in that formula that has been so present in Woodinville for so long. The wines, from producers like Avennia, Savage Grace, WT Vintners, Kevin White Winery and Lauren Ashton Cellars offer a variety of wine-making styles and personalities but there tends to be an underlying philosophy of seeking to create wines of balance. Jeff Lindsay Thorsen of WT Vintners is excited to be a part of this sort of Woodinville sea change. "The 'new' wineries and winemaking styles in Woodinville that are making an impact seem to be a reflection first of their palates, then as a response to a new generation of wine drinker. You don’t have to slather all of your wines with oak and pick your grapes at high brix to produce world class wine. Bordeaux varietals especially Cabernet Sauvignon and Cab heavy blends can handle a wallop of new french oak, but Rhone varietals like Syrah, Grenache and Mourvèdre often lose their identity and what makes them special when you put them in a new oak barrel. Many of these new wineries seem to be more focused on channeling the flavors of Washington’s amazing vineyards, rather emulating a successful formula from down south (California)." Kit Singh of Lauren Ashton sees that big extracted formula as one that was arrived at by a fairly simple conclusion. "If something is good, like oak. More of it must be better, right?" Kit though is seeking to communicate an underlying sense of restraint in his wines. For him, the formula for creating a more balanced wine is equally simple. "A delicious meal, a good recipe is balanced. Here there's a bit of salt, maybe a bit of spice here, taken together they're delicious because one isn't overwhelming everything else. A delicious meal should be balanced, and that's the kind of wine I want to make as well." For Kit there is a sort of energy and synergy happening in Woodinville particularly in the warehouses. "It feels extremely supportive, it's a real collaborative and cooperative environment." Kit sees these "new guys" as the next wave in Woodinville's development as a wine community. "In the first wave you had many of the founders, Chateau Ste Michelle of course gave us a lot of these talented folks. Mike Januik, Bob Betz, Charlie Hoppes and Delille Cellars was developing right along with them." The next wave to come was inspired by those guys and it was among others Chris Sparkman, Chris Gorman, Darby, and Efeste. As this new wave comes along with guys like Jeff, Kit, Michael Savage and Kevin White among others they've all been a product of those who came before them. They're also creating an environment that supports each other's growth. "Michael and I are friends and we collaborate a lot, he has inspired me, pushed me to try and be a better winemaker and I hope that I've done that for him as well." Woodinville's warehouses are uniquely positioned of course in their proximity to Seattle, where perhaps they might attract folks from outside the industry like Kit, or Kevin White as well as someone like Jeff who works as the wine director at Seattle's RN 74. Jeff sees that location and the unique layout of the warehouse district as a sort of serendipity for this new movement in Woodinville. "The warehouse district's concentration of wineries creates a natural incubator for the wine-curious, many of the up-and-comers started as fans, worked a harvest and caught the bug. The community of Woodinville wineries is incredible, everyone pays it forward. We have had so much help along the way. Our successes have come to us through the camaraderie that the neighborhood fosters. I am not sure when we will hit a saturation point, but for now their is very little feeling of competition. Other winemaking regions are very spaced out, our concentration has proven to be a huge part of all of our success." 2011 Avennia Arnaut Syrah, Boushey Vineyard The Avennia wines are fast becoming a perennial favorite for me and for elegance and sophistication, no one in Washington is doing it better right now. Winemaker Chris Peterson is far more established than many of his "new wave" neighbors with his long tenure at Delille Cellars as assistant winemaker. He and partner Marty Taucher now in Avennia's second or third vintage, represent a very successful foray into making both intellectual wines and "wines of place" in Washington. 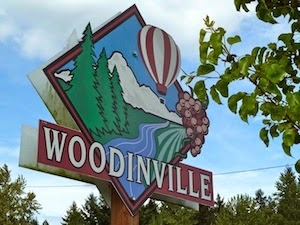 Very nice write up, and Woodinville's "style" is a very good topic to explore. Happy to here more diversity is happening with the next wave. Somebody I think has been beating a different drum for a while is Pomum Cellars, btw. All the grapes still come from the East though, 200 miles away, and as a wine "region" Woodinville is never going to be at the real forefront of Washington wine for wine geeks. The forefront is in the vineyards. Just my humble opinion too. Many thanks for the details. A great piece on the next wave in Woodinville wine!